You are currently browsing the archives for the TEA Parties category. That’s great news for the rule of law. More importantly, it’s fantastic news for the First Amendment. Most importantly, it’s a not-so-subtle refutation of the Obama-Holder-Lynch Justice Department and the Obama-Lerner IRS. It’s important to never elect another president who doesn’t put his/her highest priority on maintaining the rule of law. If we don’t have order, if we don’t respect the importance of our great institutions and principles that make the US the greatest nation on earth, then we become ordinary. That’s unacceptable. We’ve been blessed to be the world’s beacon. During the Obama administration, we stumbled. Fortunately, people like Gen. Sessions is restoring those important principles. The DFL thinks voters are stupid. Why else would they think people would buy into their line that they’ve had their taxes raised? Surely, people who work hard know whether their taxes increased. 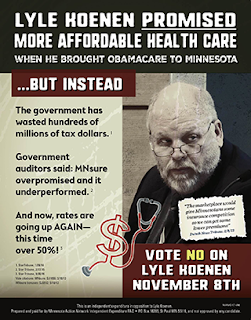 The DFL’s messaging on taxes has been a series of outright lies. They’ve used it for years. The State House of Representatives has had a GOP majority 4 of the last 6 years. Republicans held the majority in the State Senate for 2 of the past 6 years. This year, Republicans have a strong chance of flipping it back to a GOP majority again. The hit piece against Mr. Relph isn’t likely to work. It’s likely to fall short because his opponent is all about happy talk. Relph’s opponent isn’t capable of holding a substantive conversation on the important issues of the day. When you aren’t capable of winning those types of battles, you have to resort to mudslinging. 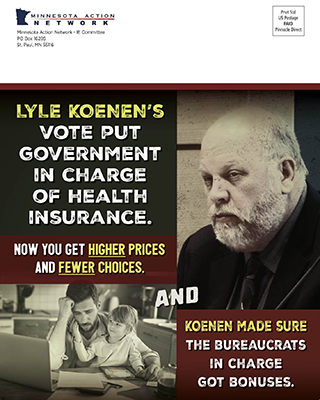 That’s what’s happening with the DFL in SD-14. Tuesday night, Jason Lewis won his primary against Darlene Miller and John Howe. Saying that this was expected is understatement. Lewis now heads into the general election against the DFL’s Angie Craig. The DCCC is already spinning Lewis as a rigid ideologue from hell. Craig’s only hope of winning this election is to make the focus on Jason Lewis. The minute that this becomes a fight between Angie Craig’s progressive agenda and Lewis’ ideas for creating jobs and protecting us from terrorists, this race is over. We owe so much to the brave men and women who volunteer to serve our country in the armed forces. When they come home from their service, they deserve access to every benefit and opportunity they’ve earned. However, so often our veterans are faced with long wait times at the Department of Veterans Affairs (VA) and service-related health problems that aren’t fairly compensated. A 2014 internal audit by the VA found that more than 120,000 veterans waited at least 90 days for healthcare appointments or never received appointments at all. And as of January 2016, over 82,000 veterans were still waiting for the VA to evaluate their claims for service-connected disability compensation more than 125 days after filing. Nowhere in that word soup is an identifiable solution. I’m not interested in another cookie-cutter politician that can identify problems but can’t identify solutions. Jason Lewis is into solving problems. He’s also a principled Constitution-first citizen. It’s time to elect Jason Lewis. This op-ed reminds us that Ronald Reagan’s Republican Party didn’t start smoothly. In fact, it’s true that the Republican Party initially rejected Ronald Reagan’s reforms. Then as now, the GOP preferred policies that maintained the status quo. Then as now, there was a rebel wing to the GOP. Back then, Ronald Reagan was that rebel. That rebel wing of the GOP was idea-driven and idealistic. Today, the GOP Establishment, in its truest definition, prefers policies that maintain the status quo and that took care of big corporations through corporate welfare, aka crony capitalism. Today, the GOP’s rebel wing has a formal name. It’s called the TEA Party. At its best, the TEA Party is bustling with ideas that would solve America’s biggest problems. At its worst, the GOP has been the party of crony capitalism and corporate welfare. These days, both parties are guilty of supporting crony capitalism and using the governments’ regulatory authority to limit competition. In 1981, the late Sen. Daniel Patrick Moynihan, (D-NY), called the Republican Party the party of ideas. When Republicans got crushed in the 2006 midterms, Mara Liasson said that that election was “the ideology-free election.” It was a referendum on GOP corruption. It was about Democrats running on criticism alone. They opposed the Iraq War for the wrong reasons but at the right time. It’s obvious that Donald Trump isn’t an ideas guy. Ted Cruz isn’t the Republicans’ top idea man but he’s a good candidate with a very good campaign organization. That’s why I think Sen. Cruz translates into being the Republicans’ best hope of recapturing the White House. Sen. Cruz isn’t just comfortable with Gov. Walker’s reform agenda. It’s that he gets the importance of getting government off the people’s backs so they can innovate and prosper. While a well-trained work force is essential, it’s indisputable that a good education is wasted if people aren’t willing to put their capital at risk. I’m not advocating for a return to the glory years of the Reagan administration. I’m advocating for rejecting Donald Trump so the GOP can return to being the party of ideas. These days, the people still left at Breitbart, and that number is shrinking, aren’t living up to Andrew Breitbart’s high standards. Their latest shenanigans aren’t likely to salvage their reputation, either. The article was written by me as part of an effort to make light of a significant company event, and was published as a result of a misunderstanding without going through the normal editorial channels. I apologize to Michelle Fields, my friend Ben Shapiro, and to everyone concerned. Former Breitbart News editor-at-large Ben Shapiro announced Sunday evening via left-wing Buzzfeed that he is abandoning Andrew Breitbart’s lifelong best friend, widow, hand-picked management team and friends in pursuit of an elusive contributorship at the Fox News Channel. Shapiro, a Harvard lawyer and member of the State Bar of California, apparently violated virtually every clause in his employment contract during an appearance on The Kelly File last Thursday evening. Based on Shapiro’s standing up for Fields, I’d argue that it’s Breitbart News that’s abandoning Andrew Breitbart’s principles. The bigger the bully, the more fiercely Andrew fought. He loved kicking bullies’ backsides. That’s who Andrew was. He didn’t hesitate in fighting the left or, for that matter, Republicans. To Andrew’s staunchest supporters, the current mismanagement team at Breitbart are a disgrace to Andrew’s principles. They, not Ben Shapiro, Michelle Fields and Dana Loesch, should be the ones leaving. I wrote this article because I couldn’t stand the thought of hearing John Nolte tell us that Donald Trump was “the great truth-teller of 2015.” That’s such total BS, it stinks from Philadelphia to San Francisco and from Minneapolis to Houston. The enthusiasm real people (as opposed to media and #GOPSmartSet) have shown for Trump and his paradigm-shattering wall is something new and exciting on the political scene. So is the “yuge” sigh of relief. Someone sees the nation bleeding out and wants to stanch the flow. Yes, we can (build a wall). From that day forward, it has been Trump, dominating the GOP primary process and setting all of the potentially restorative points of the agenda, compelling the other candidates to address them, and the MSM, too. Blasting through hard, dense layers of “political correctness” with plain talk that shocks, Trump has set in motion very rusty wheels of reality-based thinking, beginning a long-overdue honest-to-goodness public debate about the future of America — or, better, whether there will be a future for America. That debate starts at the border, too. There’s a major flaw with Trump as commander-in-chief. The Constitution only works if it governs moral people. Mr. Trump isn’t a moral person. He’s repeated said dishonest things, then insisted that he hadn’t said the dishonest things that were videotaped. Think about his disgusting statement about Carly Fiorina’s face. The first time he was challenged about it at a debate, Trump insisted that he hadn’t disparaged Mrs. Fiorina. Think about Mr. Trump’s statement that Megyn Kelly had mistreated him and that she had “blood coming out of her eyes, blood coming out of her — wherever”, then explaining that he wasn’t suggesting that he’d been mistreated by Ms. Kelly because she was menstruating. Anyone that will follow a person as morally deficient as Mr. Trump isn’t trustworthy. Ms. West, however well-intentioned she is, has essentially said that we should follow a highly immoral person. That’s something I won’t do. I’ve voted for people that I didn’t agree with. I won’t vote for immoral people. That’s why I won’t rally around Mr. Trump. “My heart is heavy with grief from the actions taken by the MN House Majority and some of the MN GOP Senators,” wrote Minnesota Tea Party Alliance president Jack Rogers on his Facebook page. That’s disappointing coming from a group that’s supposed to know the Constitution. To expect tax cuts with a DFL majority in the Senate and a DFL governor is like expecting to buy winning lottery tickets each month. The odds are the same. Republicans passed tax cuts in the House. They were DOA when they arrived in the Senate. That’s political reality. It’s also political reality that Republicans weren’t going to win many battles when controlling one half of one of the two political branches. If Rogers and Duesenberg want some of these accomplishments, then they should work tirelessly to elect more Republican legislators and a Republican governor. Without that, Republicans can’t enact their reform agenda. What is it that causes DFL politicians to reflexively lie? Does Alida Messenger implant a chip in these politicians’ brains that forces them to lie profusely? Martin saying that “Republicans refused to compromise” is disgusting dishonesty. It’s quickly disproven. Speaker Daudt and Sen. Bakk reached a budget agreement a week ago today. Of course, they kicked Gov. Dayton out of the room to finish the deal but they got it done. It’s disappointing when people I agree with don’t acknowledge political reality. What’s worse is when an entire political party proves itself incapable of telling the truth. Four months into the 2016 presidential campaign, Jeb Bush has all the money and none of the mojo. Despite the financial juggernaut the former Florida governor has built — Bush said this week he had raised more than anyone else has at this point in a presidential campaign in history — he is failing to excite crowds, dominate polls or scare away competitors. Bush comes in second or third in most polls, and when he has ranked first it hasn’t been by much. There is considerable enthusiasm for Wisconsin Gov. Scott Walker as well as Florida Sen. Marco Rubio, who many had believed would forgo the race if Bush were to make a White House bid. Bush has doubled down on his positions on education and immigration that are unpopular with conservatives, and as each young Republican contender labels Hillary Clinton “old news,” it only makes Bush seem more stale. If Bush can attract unconventional support, he could defy the expectations for an establishment front-runner. And though many Republicans are swooning for Rubio, the widespread hesitation over electing another young, handsome, history-making first-term senator who listens to rap music and has a beautiful family still makes Bush the safer bet. Bush can win the nomination just by surviving. Just ask Romney. That’s pretty pathetic thinking. Romney survived because his competition wasn’t competitive. Jeb’s competition isn’t just competitive. There’s a question lingering about how competitive Jeb is. There’s no question about whether Jeb’s got the fundraising network. There’s tons of doubt whether he can win over conservative voters. One of the rare things that Vice President Biden got right was when he said that “a leader without any followers is just a guy out for a walk.” I wouldn’t say that Jeb doesn’t have any followers. I won’t hesitate, though, is saying that his support is tepid considering how much money he’s raised and his name recognition advantage. He should be blowing his competition out of the water. The fact that he isn’t speaks volumes. It wasn’t good news for Jeb Bush, though. Gov. Bush is the top choice of just 9% of caucus-goers in Iowa. He’s the second choice of just 6% of caucus-goers, giving Gov. Bush just 15% combined. The best +/- rating in the GOP field is Scott Walker’s +48, followed by Rand Paul’s +39, followed by Rick Perry’s, Mike Huckabee’s and Ben Carson’s +38. By comparison, Jeb Bush’s +/- rating is +3 (46% favorable, 43% unfavorable.). Bush can’t win the nomination by surviving because Walker and Rubio aren’t trendy flavor-of-the-month types. They have legitimate staying power because they’re appealing candidates.